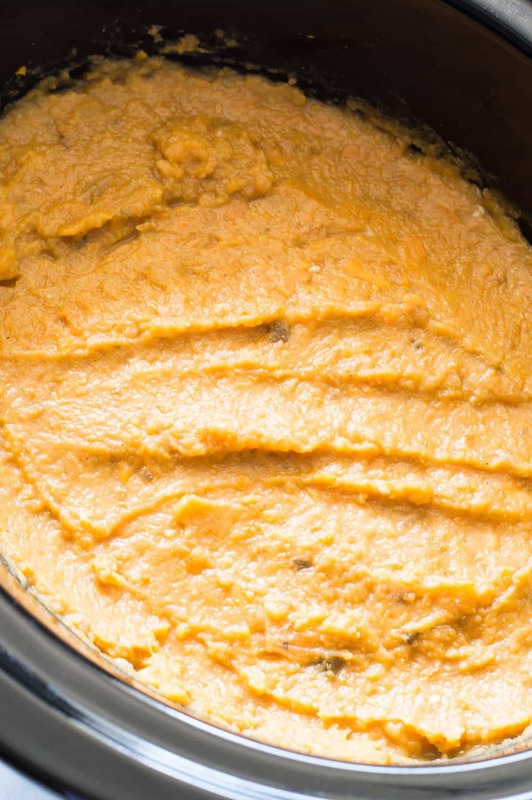 SLOW COOKER SWEET POTATO CASSEROLE. 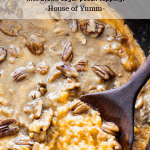 Sweet, creamy brown sugar sweet potatoes topped with a velvety brown sugar sauce and crunchy pecans! This side dish is made even EASIER by using the slow cooker, plus there’s directions for the oven also! The perfect dish for Fall and all Holidays! This sweet potato casserole recipe is so easy and simple to make. Best of all it uses FRESH sweet potatoes, but if you need to save some time you can make this dish with canned yams instead. Another bonus is the fact that this casserole can be made in the slow cooker (affiliate link)! But again, I share directions on making this in the oven also if that’s an easier method for you. Holiday dishes need to be all about ease. It’s tough making so many dishes to be ready at the same time. So knowing a variety of methods is the best way to go! This sweet potato recipe starts with fresh sweet potatoes. 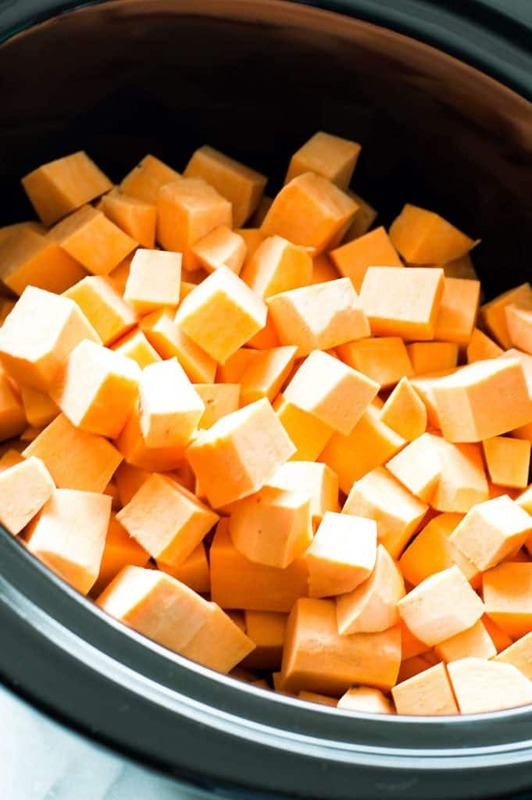 Peel them and chop them up into 1 inch cubes. 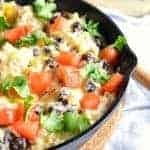 Cook them in the slow cooker to soften, cook them on the stove, or if all else fails and you need a casserole quick, you can use a canned version. My favorite is the slow cooker, because I can toss them in with about 1 cup of water, set it to high heat for 3 hours and let them cook to soften. Once the sweet potatoes are cooked and softened. We add in the other ingredients. Milk and butter make the casserole creamy and rich. Feel free to use half and half or cream if you want to amp it up a bit. I use whole milk. 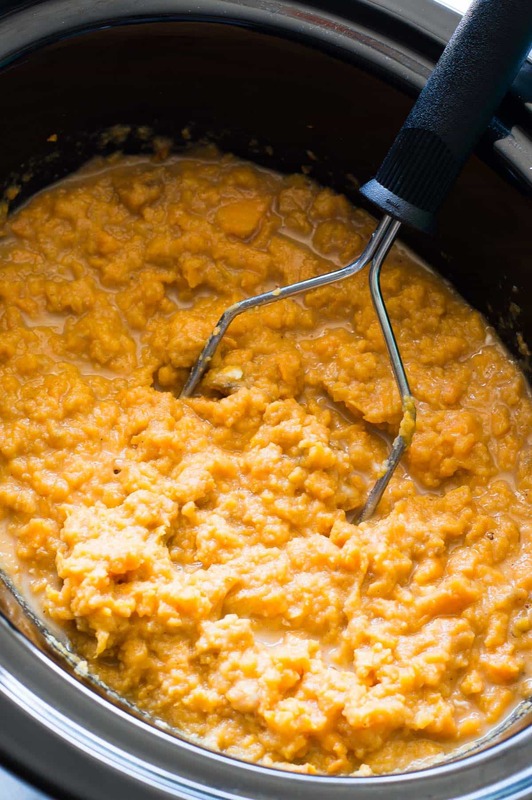 And the eggs add an almost pie-like custard texture to the sweet potatoes. Other ingredients include: Brown sugar, you can use a dark brown for a more intense molasses experience or light brown for a less pronounced flavor. Then add in some cinnamon and nutmeg. Feel free to add some cloves, and even a pinch of ground ginger if you want. I love to let the sweet potato shine though. Too many spices can take away. Mash it all together and smooth out the top. The topping is kind of why I love sweet potato casserole so much. 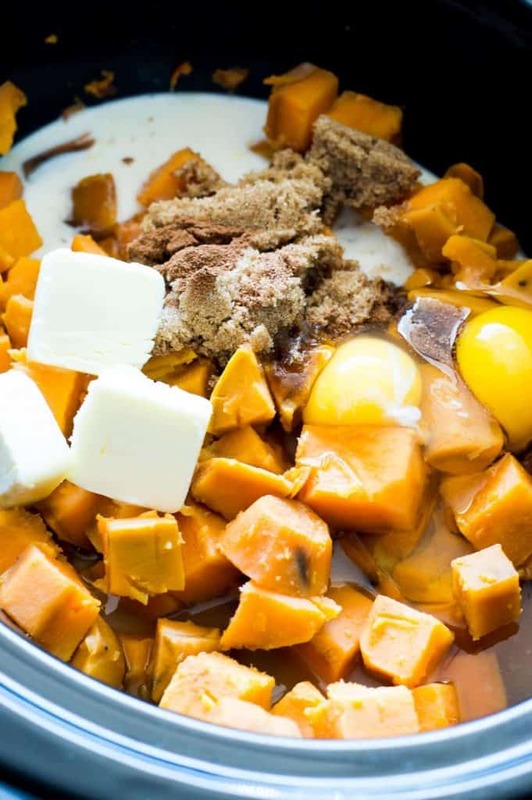 The typical toppings for sweet potatoes are marshmallow OR pecans. I’m more of a pecan type girl myself. 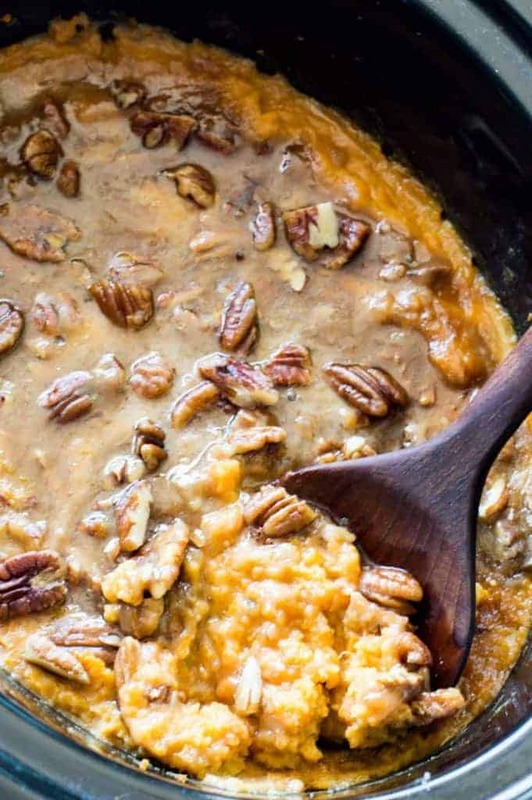 Especially when those pecans are drenched in a butter, brown sugar sauce and baked on top of creamy sweet potatoes. 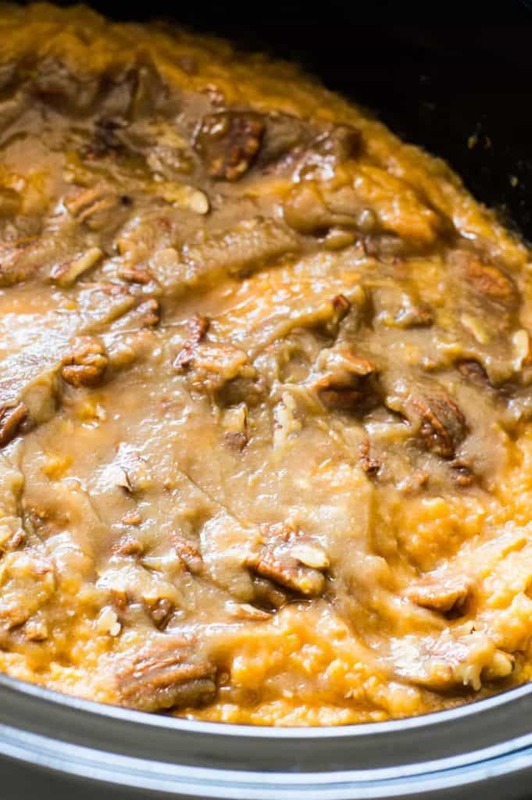 But you can very easily make this sweet potato casserole without pecans. If you would prefer to make a marshmallow sweet potato casserole: you can leave off the pecan topping. Bake the casserole as directed in the recipe, then once it’s done, turn the heat off, top with marshmallows, put the lid on and let the remaining heat melt the marshmallows and serve once they are melted. 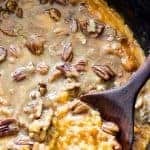 To make the Brown Sugar Pecan Topping: Pour the sauce over the top of the sweet potatoes and we will let the whole thing cook in the slow cooker, or bake in the oven, for about another 30 minutes. Then we’re left with the ULTIMATE sweet potato casserole. This casserole is smooth and creamy with the crunch of the pecans on top. Spiced with just a hint of cinnamon. This casserole will be the first dish finished come Thanksgiving, or whatever meal you decide to make this to go with! WANT TO TRY THIS SWEET POTATO CASSEROLE?? PIN IT to your SIDE DISH or THANKSGIVING board TO SAVE FOR LATER! 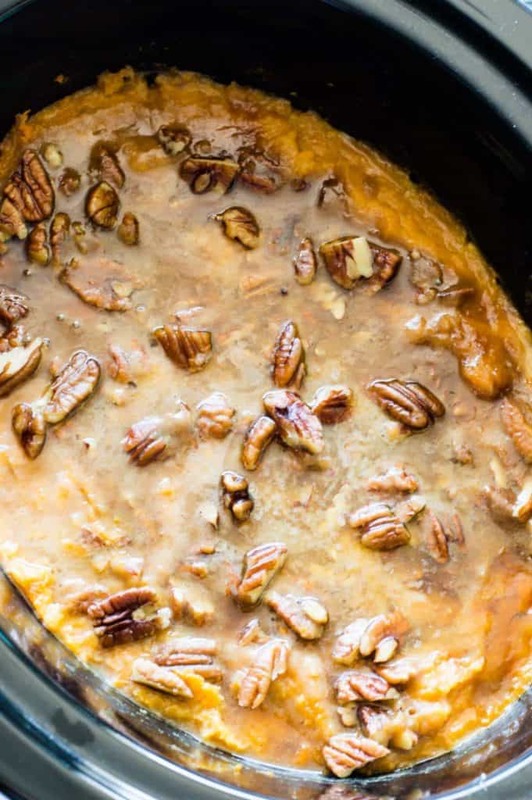 SLOW COOKER SWEET POTATO CASSEROLE. 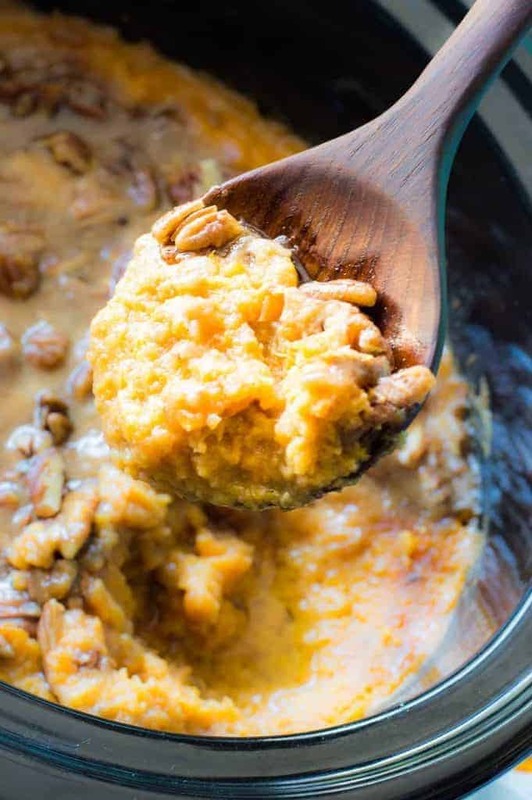 Sweet, creamy brown sugar sweet potatoes topped with a velvety brown sugar sauce and crunchy pecans! This side dish is made even EASIER by using the slow cooker! The perfect dish for Fall and all Holidays! Peel and chop the sweet potatoes. 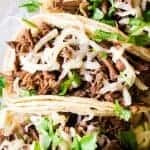 Add to slow cooker (affiliate link) with the 1 cup of water. Cook on high heat for 3 hours until the sweet potatoes are softened. Add the light brown sugar, butter, cinnamon, nutmeg, eggs, and whole milk. Mash the potatoes and mix with all the ingredients until smooth. 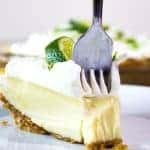 In a small mixing bowl combine the ingredients for the topping. Stir to combine. Spoon onto the top of the sweet potatoes. Cover and continue cooking on high for another 30 minutes. Peel and chop the sweet potatoes. Add to large pot on stovetop, add enough water to cover the potatoes. Cook on high heat for about 30 minutes until the sweet potatoes are softened. Add the light brown sugar, butter, cinnamon, nutmeg, eggs, and whole milk. Mash the potatoes and mix with all the ingredients until smooth. Spoon into a 2 quart casserole dish. Smooth the top of the potatoes for the topping. 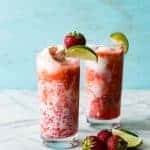 In a small mixing bowl combine the ingredients for the topping. Stir to combine. Spoon onto the top of the sweet potatoes. Bake at 325 degrees for 30 minutes. **Can use canned yams to save time. Skip to step 2!